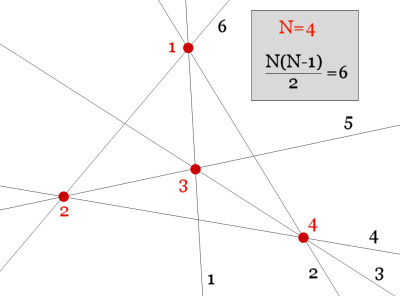 1) A set of N points generates at least N*(N-1)/2 "trivial" alignments of two points. 2) In order to look for all the alignments of 3 points, for each of the N*(N-1)/2 alignments of 2 points verify if any of the other points are aligned with the 2. All the points aligned to each pair generate a 3 points alignment. 3) In order to look for all the alignments of 4 points, for each of the M alignments of 3 points (found at step 2) verify if any of the other points are aligned with the 3. All the points aligned to each pair generate a 4 points alignment. N) The algorithm stops when no N+1 points alignment is found. 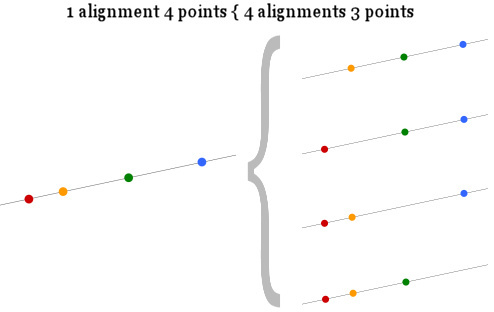 A useful trick can be added: in order to define the alignments to be tested, I have to create an array of points. Thanks to the property of "commutativity" of the points verified with the function aligned - and in order to avoid a double verification of the same set of points shuffled (for example 1,2,3 and 3,1,2) - whenever I define a set of points, I limit myself to the sorted one (so I will verify only the set 1,2,3). Note that this can be performed only because we use Definition #3 or Definition #4: "commutativity" is not a property of Definition #1 and #2! Please, download the complete R file from here find_all.txt: you can test it on R-Environment.